El Shazli is one of the figures of Sufism , he was born in Morocco where he grew up and became a religious thinker . El Shazli traveled widely in his religious quest . He traveled to Baghdad and then Tunisia where he lived in a town called Shazla ( hence his name ) . Then he moved to Tunis , where he became a popular figure . Then he moved to Cairo and after that to Upper Egypt . In 1258 , on his way to perform pilgrimage eventually traveled to Egypt and stayed in Alexandria where he preached to Mecca, Abu el Hassan el Shazli died in Wadi Homaythara where he is buried . 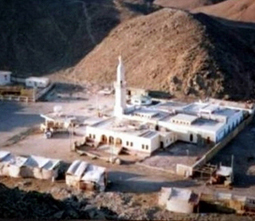 A shrine was built for him and became a popular site for the followers of his school from Egypt and North Africa .The Ministry of Islamic Endowments built the new Shazli Mosque in 1969 .